South Africa 9-264 (Graeme Smith 116, Quinton de Kock 31, James Franklin 2-38) beat New Zealand 9-260 (Colin Munro 57, Grant Elliott 54, Lonwabo Tsotsobe 4-45) by one wicket. A superb ton from Graeme Smith and a breezy 25 runs by Ryan McLaren in the dying moments of the game led South Africa to a thrilling victory vs. New Zealand. The Black Caps scored 260 runs for the loss of nine wickets in the allotted 50 overs. 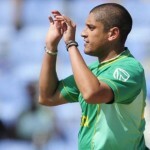 The Proteas surpassed the target by hammering 264 runs on the last ball of the match with one wicket in hand. 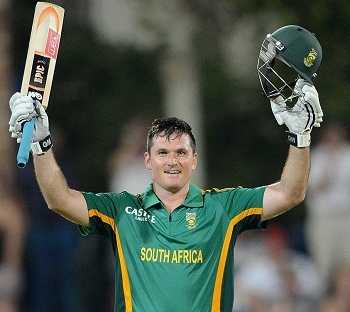 Graeme Smith (South Africa) was declared ‘Player of the match’ for his brilliant hundred while opening the innings. The third and final One Day International of the series was played on Friday, January 25, 2013, at Senwes Park, Potchefstroom. Earlier, Brendon McCullum, the captain of New Zealand, won the toss and opted to bat first without any hesitation. The decision bounced back when they lost two early wickets for just 27 runs in 9.2 overs. Grant Elliott joined in with the opener, BJ Watling, who became the next victim at 46 after scoring 20 runs. The poor form with the bat from Brendon McCullum continued when he was dismissed for 13 after the addition of 22 runs to the total. Colin Munro got together with Elliott and tried to mend the loss with dedication as the first hundred of the innings appeared on board in the 32nd over with 2 fours from the latter. Grant Elliott completed his fifth ODI fifty in the next over off Aaron Phangiso and Munro got 3 back to back fours on the last three balls. The pair enhanced the score to 129 in 33.2 overs when Elliott was caught by Dale Steyn off Lonwabo Tsotsobe for 54 off 67 deliveries with 8 fours. James Franklin came in next as Munro hit the first six of the innings in the 39th over and attained his maiden ODI half century two overs later. Colin Munro became the sixth victim at 196 after scoring 57 off 62 balls with 1 six and 6 fours as Franklin took over from there while the wickets kept on sliding from the other side. James Franklin got his fourth ODI fifty in the final over with 1 six and 1 four and remained unbeaten for 53 from 52 comprising 1 six and 3 fours as the Kiwis scored 260 with one wicket left in 50 overs. Lonwabo Tsotsobe and Ryan McLaren were the only successful bowlers among six others while sharing four wickets each. Quinton de Kock and Graeme Smith opened the innings for Proteas in a commanding way by getting 28 runs in the first five overs. Smith hit 2 fours in the sixth over and de Kock followed him in the same manner during the next over. The smooth looking partnership was broken at 83 in 15.3 overs when Quinton de Kock was clean bowled by James Franklin for 31 and was replaced by Colin Ingram. Smith achieved his second fifty in a row on the fourth ball of the 20th over as Ingram gave him a nice assistance from the other end. The duo accumulated a score of 122 in 26.1 overs as Ingram lost his wicket for 25 and the South African captain, Faf du Plessis, took guard at the crease. The run rate was picked up by the batsmen and the boundaries were being dispatched at regular intervals. Faf du Plessis was caught at midwicket by Martin Guptill off Kyle Mills for 19 as the total touched 165. Smith came to be a lone fighter after that as the rival bowlers became unplayable and the batsmen from the other end kept on surrendering. 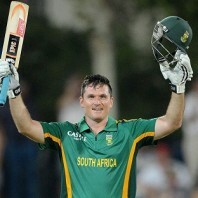 Graeme Smith thrashed his 10th ODI century in the 41st over with a couple of fours. 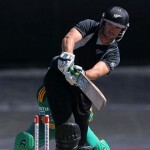 The hosts were in trouble when he was caught by Watling off Kane Williamson for 116 scored from 130 balls with 14 fours. The sixth wicket was lost at 229 in 45.4 overs and they required 32 runs from the last 26 deliveries. The all-rounder, Ryan McLaren rescued his team which was in dire trouble and the tail order batsmen were being sent back to the pavilion regularly by the Black Caps bowlers. The home side still needed 8 runs to win from the last six balls with two wickets in hand. McLaren got three runs on the first two balls and Dale Steyn managed another two on the following couple of deliveries before he lost his wicket on the fifth ball. The Proteas required three runs to win the game on the last ball as McLaren sent that flying over the long-on boundary for a six and won the match for his side. The hosts smashed 264 runs for the loss of nine wickets and Ryan McLaren secured his end with a match winning 25 runs. Kyle Mills, Mitchell McClenaghan, James Franklin and Kane Williamson claimed two wickets each whereas Nathan McCullum held one. South Africa won the enterprising encounter by one wicket but New Zealand clinched the three match series 2-1.